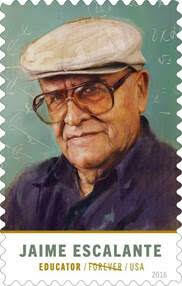 December 31 was the birthday of legendary educator Jaime Escalante. He would have been 85. The beloved and charismatic California educator used unconventional methods to inspire his inner-city students not only to learn calculus, but also to pass Advanced Placement tests in the subject. With his colleagues at Garfield High School in East Los Angeles, he proved that students judged to be “unteachable” could master even the most difficult subject. In 2016, the United States Postal Service will issue a Forever Stamp to honor Escalante. The stamp features Escalante in a digital illustration that resembles an oil painting. The illustration is based on a 2005 photograph taken by Jaime W. Escalante in a classroom where his father formerly taught. Translation service offering free Haiti relief translations!